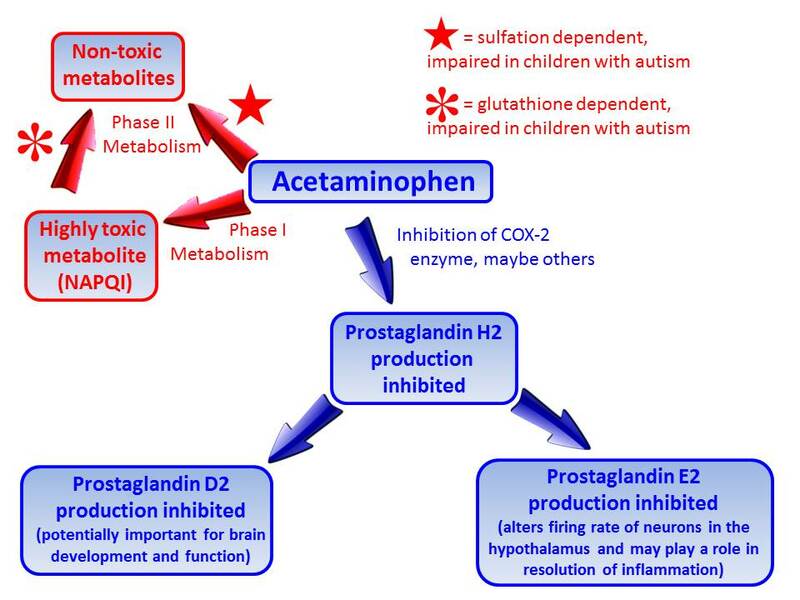 Mounting Data Points at the Potential for Acetaminophen Exposure During Early Childhood to Induce Autism in Children: A Review from Scientists and Clinicians at Duke and Harvard. 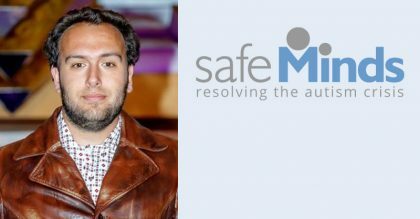 In 2015, SafeMinds published a short article I wrote about the potential dangers of acetaminophen to children, specifically addressing its potential role in the development of autism. In the discussion that followed that posting, I noted that exposure during childhood, NOT during pregnancy, appears to be the most dangerous time to expose the developing brain to acetaminophen. I pointed out that exposure during pregnancy poses a significant risk, increasing the chance of having a child with autism by slightly more than 10 percent, but that the major concern is that exposure of babies and children to acetaminophen is actually driving the epidemic, resulting in a 10-fold or greater increase in the incidence of autism. I also elucidated that many parents are unaware that their male infant was exposed to acetaminophen at the time of circumcision, and that vaccination was, at one time, a major cause for using acetaminophen. In the two years since then, I’ve worked with a team of scientists and clinicians from Duke (my beloved institution) and from Harvard, putting together a comprehensive summary of the evidence indicating that acetaminophen exposure during childhood, in combination with inflammation and oxidative stress, is the primary factor responsible for the induction of autism. The original article can be found here (journals.sagepub.com/doi/pdf/10.1177/0300060517693423). SafeMinds has graciously asked me to summarize that article, which follows here. 1. Eight peer-reviewed studies* now demonstrate that acetaminophen exposure is neurotoxic to the developing brain of humans. Seven of these studies evaluated the effect on children following exposure in utero. Effects of exposure evaluated by various groups included lowered IQ, autism, and behavioral problems. 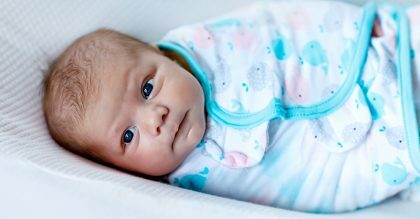 The only study to evaluate the effect of exposure after birth found more than a 60-fold greater risk (literally) of developing autism following exposure after birth than studies looking at the risk of exposure before birth. 2. A very wide range of factors, all of which are associated with inflammation and oxidative stress, are in turn associated with an increased risk of autism. Thus, it appears that whatever is inducing the epidemic of autism probably acts in concert with inflammation and oxidative stress. This conclusion is consistent with the hypothesis that acetaminophen exposure to infants and children after birth is a leading cause of autism. 3. Laboratory animals develop permanent brain damage, characterized by problems with social function, when they are exposed to acetaminophen during an early period of brain development that corresponds to human infancy. 4. Margaret McCarthy, chair of pharmacology at the University of Maryland, has elucidated the mechanism by which acetaminophen damages the developing brain, and has explained why acetaminophen is more dangerous to males than to females. This potentially accounts for the increased propensity for males to acquire autism compared to females. 5. Acetaminophen substantially alters brain chemistry, and temporarily impairs awareness of social issues in adult humans. Although the drug could naively be considered to be anti-inflammatory, exposure to the drug actually causes inflammation, even in healthy adults, and depletes metabolic components needed to deal with inflammation. Further, the drug is immunosuppressive, blocking an important immune function (the febrile response). 6. No study has ever shown acetaminophen to be safe for the developing brain of a human or a laboratory animal. A major manufacturer of acetaminophen in the US acknowledges that the drug was never proven safe for brain development when used during pregnancy or in childhood. All safety tests that have been conducted were performed with the assumption that any side effects would be acute in nature (e.g., bleeding or organ damage soon after administration of the drug). 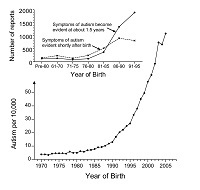 (a) The epidemiology of autism matches the historic use of acetaminophen, with both rising sharply in the early 1980s following the identification of Reye Syndrome as a possible side effect of aspirin use in children. (b) The qualitative nature of autism apparently shifted from infantile to regressive at the same time that acetaminophen use in infants and children became more popular, in the early to mid-1980s. (c) A wide range of inflammatory conditions that affect the potential to tolerate oxidative stress are associated with autism. It is expected that these conditions will adversely affect metabolism of acetaminophen. A notable exception is cystic fibrosis, a condition of oxidative stress not known to be associated with autism. Cystic fibrosis is also unusual as a condition of oxidative stress that actually enhances rather than impairs metabolism of acetaminophen. (d) Genetic variants associated with autism, many associated with oxidative stress, likely influence the metabolism of acetaminophen. (f) History demonstrates to us that it is a mistake to ignore the observations of parents when it pertains to autism. Many parents who have historically blamed vaccines for their child’s autism may have actually observed the effects of acetaminophen. In the 1990s, vaccination was advertised as the number one indication for use of acetaminophen. (g) The idea that acetaminophen use, particularly in infants and small children, is responsible for many if not most cases of autism is an attractive hypothesis, as it satisfies Occam’s Razor in being a simple explanation that explains a wide range of observations. 1. There are several unknowns: We have almost no idea just how much benefit that acetaminophen actually provides. (That was never tested.) Perhaps it can be easily replaced by non-pharmaceutical means of reducing fevers, and perhaps not. Second, we don’t know exactly how much neurological damage acetaminophen causes when administered to infants and children. 2. Despite unknowns, given the preponderance of evidence described above, we conclude that parents and doctors should know all available facts so that they can make informed decisions about use of acetaminophen. 3. An incisive study needs to be done as quickly as possible, with all available resources at its disposal. Despite the fact that acetaminophen is the most popular drug used in infants, children, and pregnant women, neither the benefits nor the risks of using the drug in those populations have been thoroughly evaluated. 4. The cost of an incisive study would cost less than the cost of raising and caring for three individuals with autism. Just three. * References are cited in the review. Our review cites eight papers, but there are others, and more, on the way. • A study by Liew et al (Epidemiology 2016; 27: 912–918) showing lower IQ associated with acetaminophen use during pregnancy is cited in our review, but not counted as one of the eight studies listed as showing neurotoxic effects of acetaminophen during development. ** Additional circumstantial evidence exists, but was not cited in our review. For example, the unexplained and unusually high prevalence of autism in South Korea (ncbi.nlm.nih.gov/pubmed/21558103) just happens to occur in a country where children’s acetaminophen capsules were inadvertently overloaded with active ingredient (saul.com/sites/default/files/3591_WCW062513tcgmp.pdf).